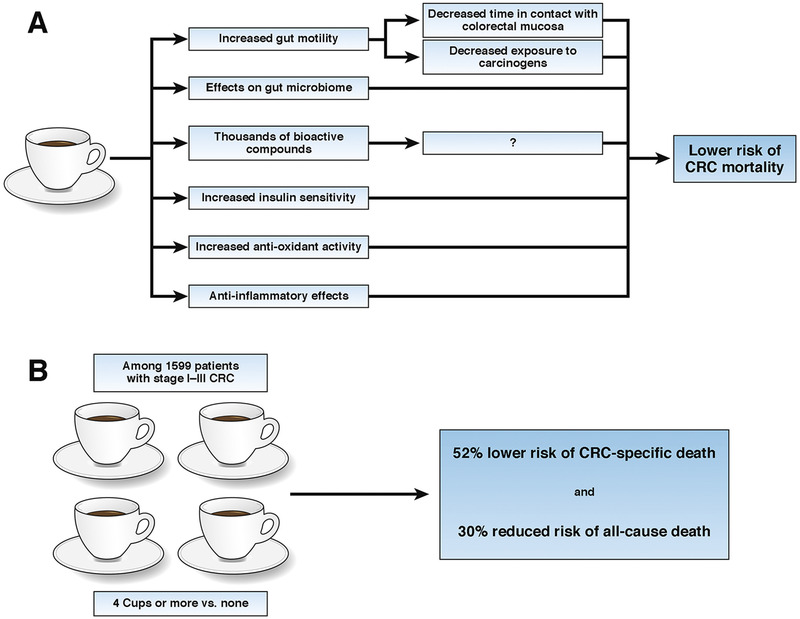 Several studies have shown that coffee consumption reduces risk of CRC and other diseases (see figure). Although it is often linked with caffeine, coffee is a complex mixture of more than 1000 bioactive compounds, many of which have antioxidant capacity including polyphenols, diterpenes, melanoidins, and minerals. Coffee has anti-inflammatory and insulin-sensitizing effects, reduces metabolic alterations caused by cancers, and promotes an anti-carcinogenic microenvironment. However, it was not clear whether coffee consumption affected survival times of patients with established CRC. Yang Hu et al studied the effects of coffee intake among 1599 patients diagnosed with stage I to III CRC who were participants in the Nurses’ Health Study or the Health Professionals Follow-up Study. Based on multivariable adjusted models, compared with nondrinkers, patients who consumed at least 4 cups of coffee per day had a 52% lower risk of CRC-specific death and 30% reduced risk of all-cause death. 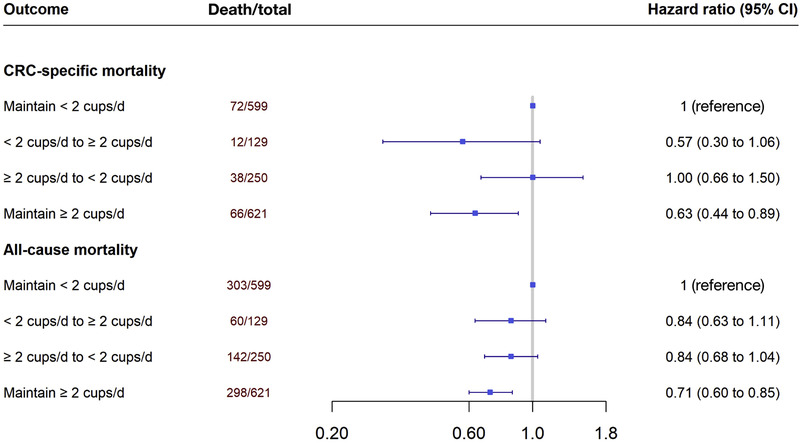 High intake of caffeinated or decaffeinated coffee (2 or more cups/day) was also associated with lower risk of CRC-specific mortality and all-cause mortality. When coffee intake before vs after CRC diagnosis were examined, compared with patients consistently consuming low amounts (less than 2 cups/day), those who maintained a high intake (2 or more cups/day) had a significantly lower risk of CRC-specific death (multivariable hazard ratio, 0.63) and death from any cause (multivariable hazard ratio, 0.71). The inverse associations between total coffee intake and mortality appeared to be stronger among patients with stage III than with stage I or II cancers. Hu et al did not find any different association by tumor subsite or among subgroups of patients. In an editorial that accompanies the article, Amanda J. Cross and Marc J. Gunter state that the study is important because there are no specific dietary or lifestyle recommendations for patients with CRC. Studies that identify dietary or lifestyle factors that increase survival among patients with cancer are of tremendous value. The editorial points out limitations of the study to consider. Both cohorts analyzed are health professionals, who differ from the general population in that they are more health conscious and more likely to work night shifts and long hours, which may affect their tendency to consume coffee. 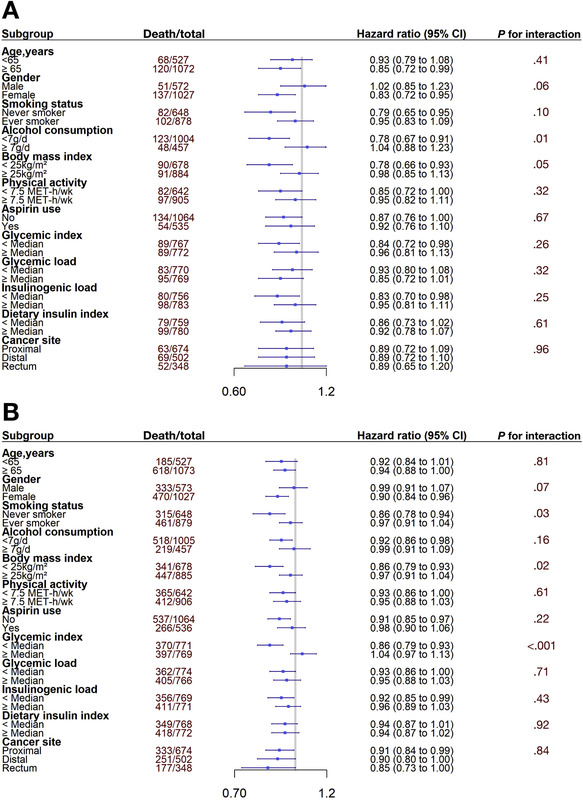 Coffee consumption is linked to other health-related behaviors, so residual confounding might persist despite multivariable adjustment of the regression models. However, given that coffee does not seem to have harmful effects, it is an ideal candidate to examine in a prospective trial. Coffee, or components of coffee, might someday be used as an adjunct to treatment to prolong survival. We need to learn more about the mechanisms by which coffee affects CRC development and progression. These could provide insight into colorectal carcinogenesis and identify strategies for treatment and chemoprevention. It is important to learn more about how coffee is metabolized, its effects on the intestinal microbiome, and the bioactivity of its compounds.